“Tenukuri-Kobo (Tenukuri Studio)” offers student course for on-site training purpose. 10 years old and/or above, due to work safety reason. * The workshop focuses on dyeing process. * 5 – 10 participants dye patterns / motifs on a piece of fabric that is 1 tan in size. 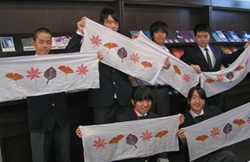 * At the end of the session, you will take home a piece of self made tenugui. Original fabric size is 1 tan. 1 tenugui size is about 35cm wide x 90 cm long. We make our best efforts on prevention of an accident and/or injury at our facility. We (Tokyo Wazarashi Corporation) are not responsible for any accidents and/or any injuries occur during the workshop/event held at our facility. Please kindly pay attention on all safety manners to have fun, learning at our facility. Please contact us for application and/or inquiry about student course.